The following are snippets form the Baptist Minutes Book dated 1929 – 1958. Most of the minutes in the book are concerned with the administration of the Chapel but the following are a few which may be of historical interest. 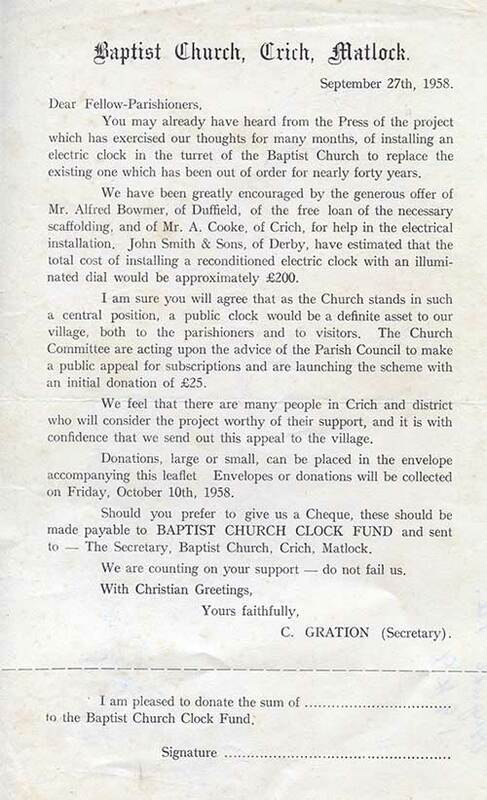 Application from the Derbyshire and Nottinghamshire Electric Power Company to erect a power cable over the Baptist Church property to the miners’ welfare. This was not agreed upon. Tribute to the memory of W T Colwlishaw who had been treasurer for 40 years. To obtain estimates for putting in working water closets for the 3 cottages occupied by Mrs Flint, Mrs Haslam and Mrs Neville. New hymn books “The Baptist Church hymn book” ordered to replace the very much worn The Baptist hymnal. Owing to poor attendance the 3.00 pm service changed to 6.00 pm with blacked-out windows. Agreed that Ivan Baldwin and Miss Gaunt have the use of the Chapel for their wedding on 11 May and the use of the schoolroom for their reception. Mr Noel Harrison (caretaker) called up for military service. Mr Burrows, Liberal Candidate given permission to use the Sunday School room as his committee room. Permission given to use the schoolroom for the purpose of distributing ration cards. Owing to deterioration of the gas fittings estimates requested for electrical installation. Estimate received for fitting electricity of £70.10.6. An alternative quote from Jewitts of Ripley requested. Sunday School to discontinue the Whit Walks preferring a Whit Sunday afternoon demonstration in the Market Place. Education Authority requested permission to use Baptist private road to the meal centre to avoid children using Sandy Lane. This was agreed with provisions; children kept under supervision; Education Authority responsible for any damage; the path be maintained by the Authority. Mr Clark Chemist applied for tenancy after Mr Lake had left the property. He wanted it for storage. This was agreed although he was advised strict conditions would be applied – it was unacceptable to allow the property to look like a warehouse. Mr Alfred Bowmer offered free assistance in the installation of the new electric Clock, in preference to the reconditioned one..